1. THE HANDLING OF WEEKLY SCORESHEETS, TEAM FEES, APPLICATIONS: Team Captains should collect all league fees, dues, and membership applications from the players on their own teams. Each Team Captain is then responsible for turning in their score sheets, money and new applications for team to the appropriate drop-off location. Teams are responsible for shortages. 2. TEAM FEES: Doubles Division fees are $20.00/Team. Locations that have "greens fees" are charged by the location in addition to APA team fees. (Do not include “green fees” in envelope.) All matches are to be paid in full on the original night of play. Full team fees are due regardless of how many players actually play (i.e. - there is a forfeit in a match). Full Team Fees are also due if a full team forfeit. Teams who drop during the session will owe all past dues, as well as the fees for the remainder of the session. 3. MAKE-UP MATCHES: Make Up matches are limited to two (2) per session. This league, just like all APA leagues, is to be played on the designated night and we do not allow your team to inconvenience your opponents on any kind of regular basis. You MUST notify the APA office AND your opposing team a minimum of 24 hours prior to play, or the match will be considered a forfeit. If BOTH teams agree to do a make-up match the day of, it will be approved, as long as the office is notified of when and where. Regular fees still apply for a forfeit, for both teams. Regarding Makeup matches for Holidays, weather, etc., see Regular APA By-Laws. 4. FORFEITS: A maximum of one (1) team forfeit will be allowed/session. Any team that exceeds the forfeit maximum will not be eligible for the playoffs. All matches should be played and scored. Full Team Fees are due if a full team forfeit, from both teams. 5. SCORING: Weekly play is made up of 2 singles matches and 1 Doubles match. The Doubles match is played with Alternate Shot format. Singles matches are scored with the 3-point system, ie. individual matches can finish 3-0, 2-1 or 2-0. The Doubles match will be scored the same way, only double points (ie. 6-0, 4-2 or 4-0) One (1) bonus point will be awarded teams who turn in their completed weekly fee, signed paperwork on time and have no outstanding past dues. Teams have two (2) weeks to notify the office of missing bonus points. Byes are awarded 8 points. Individual single forfeits will be worth 2 points (3 in playoffs.) Team Forfeits are worth 5 points. In other words, a match could be worth as much as 12 total points. 6. PLAYER/ ELIGIBILITY: Local and National rules. All players must play a minimum of 4 singles matches during the session with their team, in order to be eligible to participate in the Straight to Vegas Tournament. ALL players MUST have ten (10) 8-Ball scores played in the past two years in order to enter and play in the Local Doubles League. *Any team/player that does not have an established handicap and want to play in doubles MUST sign an agreement, acknowledging that if they exceed SL 10, they may need to either split up, (if session allows, and is approved by the office) or lose playoff qualification. In addition, players on winning teams must have 20 singles lifetime matches in 8-Ball (Regular league, Ladies, Doubles or Singles Boards) prior to March 15 of year qualified for, in order to be eligible to play in the National Championship in Las Vegas. (National Rule) Qualified Vegas players must stay on an active 8-ball roster through Spring Session the following year, and play at least 4 times during that Spring session. 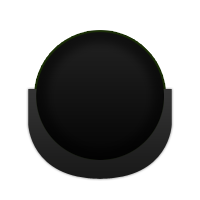 Players cannot participate in the 9-Ball Shootout (singles) or Wheelchair Challenge in Las Vegas if qualified for the 8-Ball Doubles Championship. 7. TEAMS/ELIGIBILITY: Teams must be made up of 2 OR 4 players. Teams must be able to meet Skill Level 10 max, combined at the start of the session. (If 4 players, 6,6,4,4 or 7,3,5,5, etc) If players go up during league play, they will then play to that handicap. The max increase is SL 12/combined. If players go up more than that, they have to split or be replaced. Teams that have 4 players on them are essentially two teams, who play at the same time, together, so if someone is out of town the team can still play. (Teams with 3 eligible players, may only play 2 in playoffs) Please note: As example; If a team is made up of 6,6,4,4 the weekly team cannot show up with two SL 6 for night of play. Teams need to be a High/Low or Low/Low player during league night and playoffs, or a max of ten, if roster allows. 8. 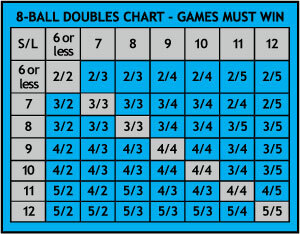 SESSION: Doubles League will run (2) sessions/year. Each session will run 11-12 matches, every other Friday. 9 PLAYOFFS: There will be a Playoff following the end of each session that will qualify teams for the Straight to Vegas Final. Teams will split into teams of two players (if 4 on the roster) and MUST attain lowest combination possible. In other words, if a 4-person team is made up of 5,5,4,6, the two fives must play together and the 6 and 4 must make up the second team. However, if the team is made up of 4,4, 3, 5, the 5/4 can play together since neither team will break 10. Only the Scotch Doubles part will be played at playoffs. 10. Time Out/Coaching: Teams who are NOT shooting may converse quietly, as long as do not interfere with the shooting team. One time out per rack is given. 11. Any roster changes must be made prior to the last five matches remaining in the schedule. Changes must be in writing on scoresheet at that time.